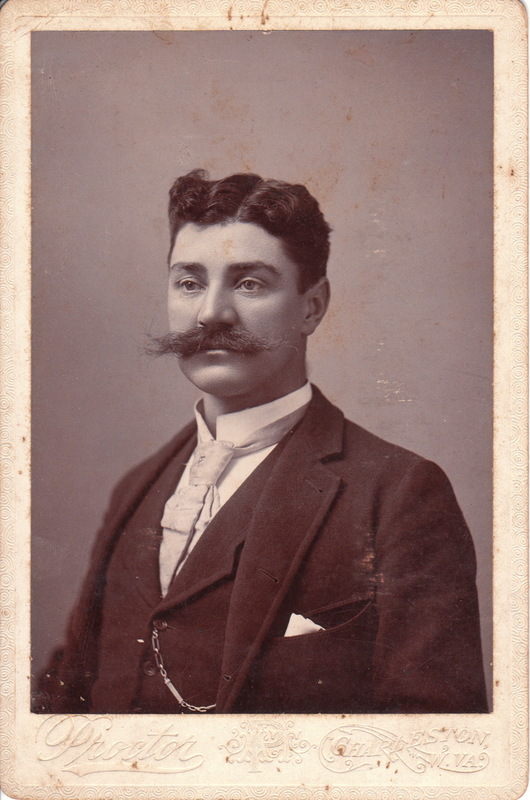 The Proctor studio produced this cabinet card portrait of a man with a walrus mustache. This admirable facial hair places this image in the category “Mustaches (Only the Best”). Click on the category to view an array of notable mustaches. A. T. Proctor’s studio was located on Capitol Street in Charleston, West Virginia. He was the successor to the Becker & Fell studio. Alfred Tobert Proctor was born in 1864 in Catalpa, Virginia. Sometime about 1888 he began his photography career in Charleston. He originally partnered with Elmer B. Tully (Proctor & Tully). In 1894 they moved their business to Huntington, West Virginia leaving photographer William Erskine to run the Charleston studio. In 1897 Erskine joined the two partners in Huntington. Ultimately the partnership ended and the three photographers operated independent businesses. Proctor was very active in the photography community. He served as President of the American Photographers Association for several years beginning in 1910. He competed in many exhibitions and Eastman Kodak used his portrait in its national advertising. He died of a heart attack in 1933. Much of his work now resides in the special collections library at Marshall University.